By the way ronski do you use the powerchute software? I am considering monitoring via pfsense instead since that has a UPS package that is compatible with these units, as then I can check it from any device on my lan. Yes I do, I have it set up to email my phone, also to shut the server down after X minutes. I've also configured the outlets so that only half are turned off when the server shuts down, so I can keep some stuff powered for much longer. The personal edition doesnt have some of those features (backup models) But I can setup the email notification using pfsense. Ronski if I did the research prior to purchasing I perhaps would have gone with this, a cyberpower but lower wattage than the one you posted. It seems APC is the intel of the UPS market, where they charge a premium for their brand, and cyberpower is the AMD which is better value. The APC unit I has thankfully does have AVR (some of their consumer devices do not), but I still have the limited consumer version of their software, simulated sinewave and had to purchase extra components so I can use it for my purpose. The cyberpower units have much better software for consumers, cheaper pure sinewave as you shown, and even have normal power plug sockets at the back. Of course its possible they may cut corners to achieve the prices they do, but as you said reviews mostly hold out. If I was buying today I perhaps would have got the £150 cyberpower, £35 more than the one I did get. If anyone else is reading this thread and wants a pure sinewave UPS at home without spending £400 on a smartups, then consider cyberpower. With all this said the device I got is doing its job to spec, my pc stays on without no abnormality if I run a test, the buzz is ok I have confirmed now, APC do have a warranty for damaged equipment caused by their units as well. The personal edition software has these features. A summary page which shows amount of undervoltage (brownouts), overvoltage, blackouts and electrical noise within a set time period, the time period viewable is either 1 week, 4 weeks, 12 weeks or 24 weeks. It has a note stating short instances of problems will not appear on this page. There is no historical graphs like the business edition. Current status page, shows the power been drawn from the unit (which I like), the power source in use, charging state of battery, input voltage, and date of last blackout and self test. A run self test page to stimulate a power failure. Energy usage page to estimate electricity costs of devices powered by the UPS. Auto shutdown cannot be disabled, it can either be set to run the PC for X amount of minutes on battery, or shutdown when X amount of mins is remaining. The audible alarm on the unit can be disabled or set to only sound at certian hours, there is no email notifications function. The electrical noise sensitivity can be adjusted to either low, medium or high, medium is the default. I am on the default of medium and no instances have been tallied. Finally a voltage page where can adjust upper and lower voltage limits before battery intervention, I have left on the defaults. Now I installed the software on my laptop so I can watch the status whilst using full screen stuff on my PC, but the obvious flaw is that if there is a power cut the UPS may shutdown my laptop. I am likely to connect it to my pfsense unit and monitor it from there instead, and the pfsense unit if I choose to can send a network signal to my PC to shut it down. This will also allow me to monitor from my phone etc., setup email notifications, and graph data on pfsense. Looking good, bet you won't get any more power cuts now. For the curious Leicester has continued to have power cuts, I have not had the new one's but in the past 3 weeks meridian business park has had 7, and glenfield area has had 3 more also. My UPS has logged 27 brownouts. So an update, the issues have been continuing in my area, mostly brownouts rather than outages but this christmas instead of power cuts I got informed in advance of a planned outage, expected 1 hour. My modem is not connected to a UPS tho so that lost power regardless. By time I started shutdown on my PC there was 92% power left. Its logical to conclude this drained a bit more prior to actual power been shut off from it. The devices left drawing power were my ac68 wifi access point and pfsense unit. Before now I didnt know what power usage these consumed, but now I do as after power came back on, I checked the utilisation via my laptop and between them they load the APC unit up to just 1%. So at PC shutdown the unit estimated 22mins of usage with 18% load. This load was with PC and the PC monitor amounting to the extra 17%. Power cut lasted 1hr 45mins, so 1% load should have bee a breeze right? At about 1hr 20 mins the flashing green light on the APC unit stopped flashing but it was still buzzing away supplying power so I paid no more attention and carried on using my phone. At about 1hr 43 mins (yes just before power was restored, kinda unlucky) there was a quick beep and it shutdown. Now my laptop is consuming about 16 watts in its low power mode at idle state and thats with screen off. Its battery is way smaller than whats in the APC unit, when power was restored it had 70% left. The APC with a much bigger battery only had to supply just 7 watts. When I powered up pfsense, I logged into the gui about 15 mins after power came back on and there was 8% capacity and in charging state, so it does indeed look like the battery was drained. Probably not to 0% I expect it shuts down before that but I expect to 5%. I checked the load and it was 1% so thats how I knew was 1% as PC was still powered off. Underwhelmed, see if I were to get a better UPS for the PC which I Was thinking off anyway and passed this down to my modem, it seems it wouldnt even be able to power my modem for 2 hours, and these things are supposed to handle little devices like modems for several hours. Ronski and others who run a UPS what are your thoughts? My first thought is how old is the battery in the UPS? PS I would think the power draw was more than 7w, try checking with a proper plug in power meter. Good idea, I will check with my watt meter tomorrow. It looks like may 2017 I got the UPS, judging by dates of older posts in this thread so about 19 months old. Battery should be OK, but I suppose it could be a lot older than its purchase date. My UPS at work has a runtime of about 20 to 30 minutes, but does last a lot longer as I tend shut the pc down pretty quick to preserve power for the voip phone and networking equipment. Can't remember how long it lasts, same goes for my home system. ordering a UPS cause im not happy with the state leaves my pc in and possible damage to pfsense unit. for the curious i am at the exact same sync speed so i still believe the line is banded now. You might consider now re-installing using the ZFS filesystem! I managed to kill the boot of mine pulling the power when it had hung due to a bug in Unbound (I think) but ZFS is supposed to be much more reliable and kinder on SSDs, plus the bonus it handles TRIM automagically vs the old filesystem where you have to enable it manually. more problems, and even causing me sync issues, as other modems drop out affecting signal mappings on the dslam. So been getting lots of brownouts, UPS keeps momentarily kicking in, power vans were here yesterday and day before, they back today so went across road to ask them whats happening, and another feed keeps cutting out, they still trying to find the fault, it isnt my feed, but when the feed cuts out it affects all the other feeds in the cabinet. things are getting messy, half the road is dug up (its a main road quite long) they are trying to find the fault and every time they tried to turn on the faulty feeds yesterday the whole street tripped out. Seriously considering newer UPS devices at the moment to cover all my devices I am 50/50 on it. 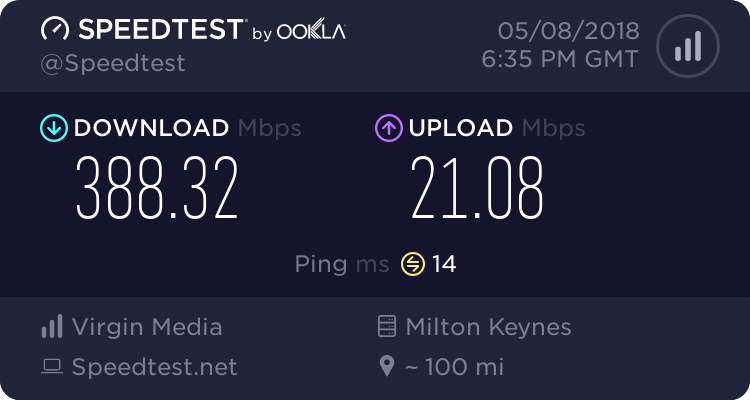 But with the amount of concrete dug up, then surely vodafone and openreach could take advantage as well to deploy FTTP on the cheap.